From the stirring sight of a heart-shaped mountain in Uummannaq, Greenland, to a train journey across the prairies to the Canadian Rockies, 'Grand Maple Leaf Explorer' is a superlative holiday in all respects. The latest offering from luxury boutique voyage and cruise specialist Cruise Traveller starts with a flight to Ottawa from Australia. The holiday lasts 23 nights and includes a fabulous cruise from Quaasuittuq to Kangerlussuaq, two names that will intrigue your friends if you send postcards. 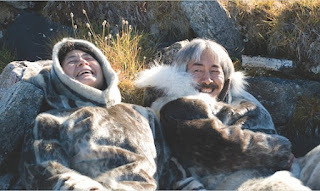 Quaasuittuq is also known as Resolute, which is easier to spell. 'Grand Maple Leaf Explorer' departs Australia for Canada's capital on 14 August 2016. Packed with highlights, the holiday is attractively priced for couples and for single travellers. Prices start from A$23,395 per person, twin share, and single travellers can enjoy sole-use occupancy of a Category 3 inside cabin from A$25,155 while the offer lasts. The prices include international flights from Sydney, Brisbane or Melbourne to Ottawa and return from Vancouver. The ship is Ocean Endeavour, which carries no more 198-passengers and is perfect for expedition cruising. Outfitted with twenty Zodiacs, advanced navigation equipment, multiple lounges and a top deck observation room, Ocean Endeavour is purpose-built for comfort in remote environments and is rated 1B ice class. On the cruise, search for polar bears and walrus in far north Baffin Island. In Ikpiarjuk (Arctic Bay) visit a traditional community who live in the shadow of towering cliffs, amid nesting habitats for seabirds and seas frequented by narwhals and bowhead whales. At Mittimatalik (Pond Inlet), locals will welcome you with throat-singing and Inuit games, before you explore Baffin's mighty fjords. Zip along in Zodiacs among freshly calved icebergs off Ilulissat, and hike around Itilleq Fjord. Spectacular Sondre Stromfjord makes a glorious finale to the trip. The site outside Uummannaq where the famous Greenlandic mummies were discovered. Ilulissat ice fjord, where 90% of the north Atlantic's icebergs are born. Niqinganiq (Isabella Bay), a bowhead whale sanctuary, the world's first Inuit-managed reserve of its kind. The cruise offers educational presentations, interactive workshops and evening entertainment. All shipboard meals are covered in the price, including on-deck barbeques and afternoon tea, 24-hour coffee, tea and snacks. Hors d'ouevres and snacks are served during evening recaps. Travel aboard Canada's VIA Rail from Toronto to Jasper on the famous 'Canadian' route. The original stainless steel 'streamliner' railcars, made famous in the days of classic rail travel in the 1950s, have been totally refurbished, with air conditioning, café car, lounge car and dome car. Stay in Jasper in the heart of the Rocky Mountains. In addition, there are two nights of free accommodation, one at the Fairmont Chateau Laurier Hotel Ottawa (or similar) and another at the Fairmont Royal York Hotel Toronto (or similar). The seven-night Across Canada rail/coach tour from Toronto to Vancouver includes a sleeping berth aboard VIA Rail's Sleeper Touring service for three nights between Toronto and Jasper. Hotel accommodation is included for four nights, (at the Fairmont Park Lodge Jasper, Fairmont Banff Springs hotel Banff and Sun Peaks). Also included: charter flights from Ottawa to Quaasuittuq and from Kangerlussuaq to Toronto. To impart the flavour of land touring on 'Grand Maple Leaf Explorer', the itinerary for just one memorable day takes in an Ice Explorer ride on the Athabasca Glacier, then a stop at the award-winning Glacier Skywalk to experience a glass-floored observation platform 280 meters over glacier-formed valleys and waterfalls. Continue along the Icefield Parkway with stops at Lake Louise, Bow and Peyto Lakes, the Crowfoot Glacier and the Athabasca Falls. Remember to keep your camera or smartphone handy for sightings of bears, elk, moose and mountain sheep!